A Daily Diet For All Types Of Small & Medium Sized Tropical Fish. The smallest wafers suitable for all types of small and medium sized torpical fish to make a superior color. A complete and balanced combination of premium proteins offering unequalled growth rates. Contains high grade marine and vegetable proteins to promoto ready acceptance, efficient digestion and superior nutrient utilization. Rich in Spirulina and Astaxanthin to promote vivid coloration not possible with competitive foods. 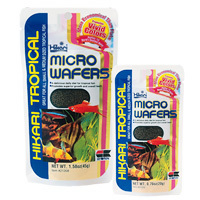 Another Hikari original, a miniature(micro) wafer developed specifically for most tropical fish to easily devour. Expect improved water qualitiy over flake foods because it’s easier to avoid overfeeding and will not dissolve in water. Feed two to three times daily.Feed only the amount your fish will completely consume in a few minutes. Always avoid over-feeding. Ask your retailer about other Hikari diets to meet the nutritional needs of your aquatic pets.